A Feed-In Tariff (FIT) consultation is underway, but the fact is that the UK FIT will end in just 9 months. In truth it is inexplicable why the UK government will not be updating and extending the FIT for electricity produced from biogas production from wastes using the AD process. will never be competitive with the leading renewable energy technologies. Other renewable energy technologies, such as solar photo-voltaic have a 40 year development lead time ahead of anaerobic digestion. For example, solar cells have been commercially available since the 1970’s, and are only now economically viable in the UK with little or no subsidy – about a 40 year lead time. Some renewable energy technologies are now available at such a low cost that it is totally reasonable that governments may see no need to continue the FIT subsidy for them. But, the same does not apply to biogas and biomethane production and especially in the area of small-scale renewables and the farming sector. It still has enormous potential beyond the scope and size which commentators attribute to renewable energy from anaerobic digestion. Development time for AD has still only been remarkably short. More time should be allowed. 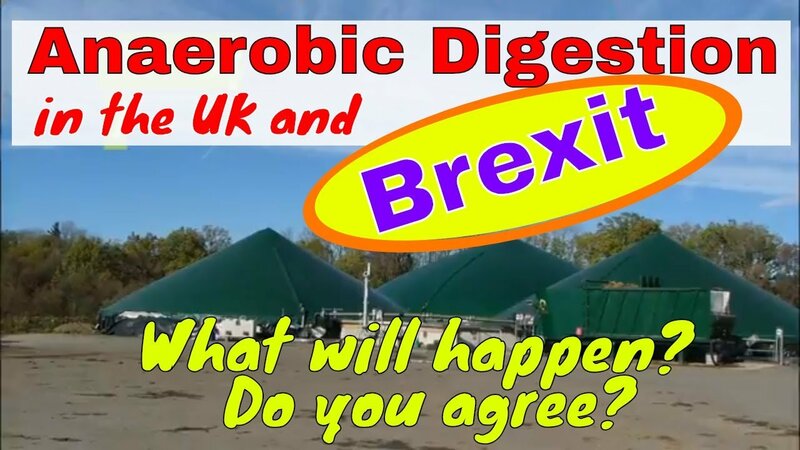 UK and EU policy is for AD to run on waste organic materials, and this has required a new generation of technology to earlier much simpler “food crop” biogas plants. AD was only included as a “waste technology” for the first time in the UK in the 2002 report “Waste Not Want Not“. 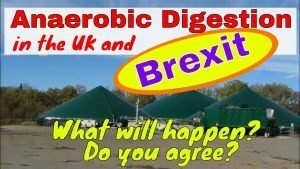 For the first time Anaerobic Digestion as a waste process had government support, and that report states that; “with [the] right incentives, [waste AD plants] could be on-stream by 2006-10, subject to securing planning [permissions]. That’s just 12 years of operating and technical development time, from the very first waste AD plants to now. How is that enough time to nurture such a vital technology with so many other benefits? Renewable bio-gas offers CO2 neutral combustion. In evidence of the infancy of the technology, and the need for more time to achieve better economic viability, just look at estimates provided in consecutive reports on the potential energy output from biogas production/ size of the market. The estimated size of potential energy production from the technology rises progressively as each new report is produced, mostly because the range of organic wastes which the technology can run-on continues to widen. Look back through the reports prepared by ADBA of the last 10 years and this is clear. Even in the last month ADBA and the WBA between them have upped their estimates. 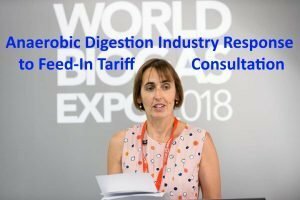 It is interesting to note that ADBA cites the total carbon saving possible from biogas technology as 4% on their Biogas Show website for their 2018 show which took place last month (July 2018), and yet the World Biogas Association WBA has subsequently issued a report in which a rise to 5% is stated. A 1% rise between recent reports. new AD feedstocks are continually becoming viable, and will continue to do so, as problems with the process in using various feed materials are being progressively ironed out, through research and innovation. Some might say that if biogas production is not yet available at low-cost, why should it continue to be assisted from public money? The reason is to adopt that view completely misses the fact that innovation can still, if allowed to continue with minor UK government incentivisation, can and probably will yield step change improvements in this technology. application of enzymes, and better control of digester micro-organisms including new high and low temperature biogas processes to raise biogas plant yields by orders of magnitude and improve process stability. “With the Feed-In Tariff (FIT) confirmed to close in just nine months’ time, this was an opportunity for the government to prove that it is committed to providing the investment that is absolutely critical to supporting small-scale renewables, which make a vital contribution to decarbonising and meeting increased demand for electricity in the UK. Unfortunately, this is an opportunity that has been well and truly missed. Scroll down to see what will happen AFTER BREXIT! 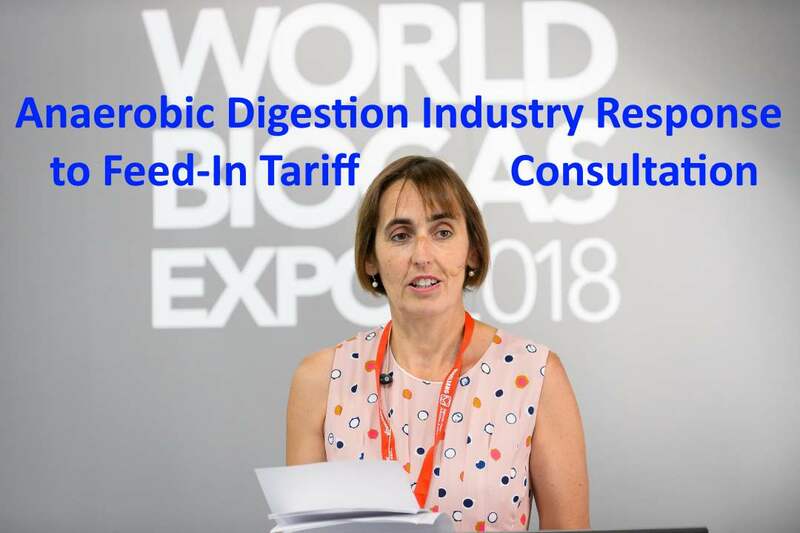 “As well as providing renewable baseload power, anaerobic digestion (AD) combined heat and power (CHP) under the FIT has been vital in helping to decarbonise the farming sector. With the government no longer providing direct for support for the generation of renewable electricity, on-farm AD will struggle to deliver its numerous non-energy benefits, which include reducing emissions from wastes, improving air quality and resource management, and restoring soils through the production of nutrient-rich biofertiliser. This also puts at severe risk the more than 300 AD CHP plants currently in the planning pipeline. “It’s therefore vital that the government rethinks its baffling decision to have no new low-carbon electricity levies until 2025, which risks creating a valley of death that small-scale technologies such as AD could easily fall into. A public consultation is underway in the UK, but the decision already made is clear. No matter what those consulted say, it will not change the decision made by conservative politicians. By removing the enhanced Feed-In Tariff rate paid to producers of electricity which feed it into the national grid, the UK government will fail to support biogas generated Small-Scale Renewable Energy. No other support mechanisms are available or planned, which might replace the Feed-In Tariff. This failure will be most badly felt by the farming industry in the UK. In principle, we consider that subsidies should cease unless essential without jeopardising the development of a technology of huge national and global strategic importance, (especially toward climate change reduction). Nobody we have ever spoken to in the UK biogas industry objects to that. we have provided ample reasoning above in our article to show that such views are unsupportable. Please join with us in our objection to stopping the UK’s special Feed-In Tariff for biogas electrical energy fed into the UK national grid, by commenting below. On a lighter note, let us be optimistic! Here is our latest video. Watch (it’s very short) and also please comment. Spot on, Biogasman, and especially true of the micro smallscale AD technologies. Youlgrave Community Land Trust have just completed a feasibility business study to use all our District Council foodwaste, local agricultural market & industrial estate waste to generate energy, fertiliser and optional upgraded biofuel for fleet transport which was viable; assisted by FITs to benefit the community via the council from current reduced processing costs. In the initial stages of the study when we considered a micro demo scheme for 4 villages (not viable!) we obtained plant quotes from 4 UK suppliers, one of which was a very interesting, optimised, innovative design by a UK agricultural college that has stopped development work due to lack of such government incentive support. A tragedy for the potentially emerging industry due to the vision & policy failure of HMG BIS & Defra. Brian – Thanks for sharing your experience. So much hard work for nothing as well. And, much money is lost in developing projects for nothing, when government support is removed in the latter stages of projects like this. As far as I can see, this post is interesting… I did not waste time reading this original and essential entry! Hi! You know they dropped Feed in Tariff for solar so fast too. Investors lost money and many fitter lost jobs when sales went into free-fall. renewable biogas. Clever work mostly! Keep up the good works guys. Looking forward to hear from any of your organization the soonest. What about? If you want to hear from us the way to do it is to complete our contact form. Its like you learn this guys! You seem to know so much about this, such as you wrote the ebook on it or something. I think that you just can do with a reality wake-up, THE LITTLE GUY always gets the bum deal. Big guys lobby, and contribute to party funds. Little guys always get zilch. However other than that, this is wonderful blog. A great read. Hopefully, all those disappointed with HMG proposed cutoff @ 5MW, responded to the online consultation along with ADBA etc.